LEAD JUDGMENT: CHIMA CENTUS NWEZE, J.S.C. This is an appeal against the judgment of the Court of Appeal, Lagos Division. Sometime in 2005, Frank Amah, the Managing Director of the appellant, approached Mrs Julie Adinuba, (PW8), to assist with the sale of certain items of property of the Federal Government of Nigeria. These items of property were located at Ikoyi, Lagos State. As proof of authority to sell the said items of property, Frank Amah handed over letters of allocation from the Federal Government Implementation Committee to the PW8. On her own, the PW8 approached Gordon Omoegbedi, (PW7), to assist with investigation and confirmation of the genuineness of the allocation letters. Incidentally, PW7 is an Estate Surveyor and Valuer. The allocation letters were confirmed to be genuine. Later, PW8 approached Donatus Duru (the complainant who testified as PW3). 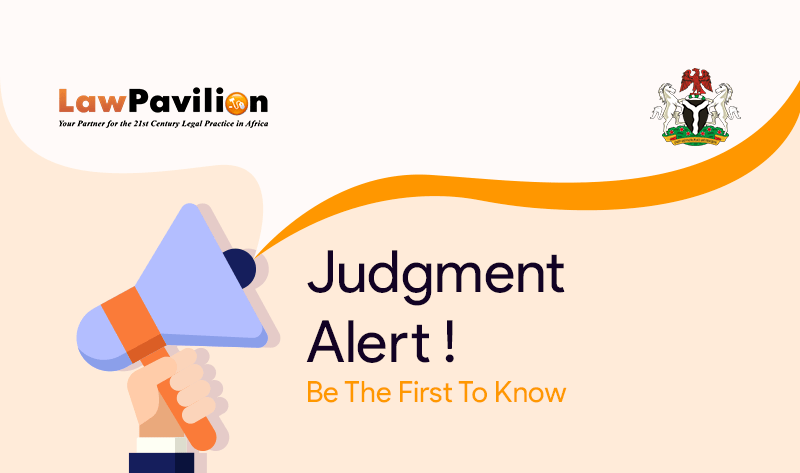 PW3 indicated interest in the property covered by the Allocation Letters, that is, the property at No 7 Bell Avenue, Ikoyi, Lagos, a property allocated to one Alhaji Mallam. PW3, upon confirmation of the genuineness of the letter, agreed to purchase the said property for ₦190,000,000 (One Hundred and Ninety Million Naira) after negotiation with the appellant’s Managing Director. So soon after the conclusion of the transaction, the Federal Government cancelled the sale of Government Houses in Ikoyi. The names of the allottees, who were affected, were published. Promptly, Alhaji Abubakar Mallam, PW4, wrote petitions to various government agencies. He alleged that someone had, without his authority, used his name to buy a Federal Government property in Ikoyi. The EFCC, upon conclusion, filed charges against the Appellant and its Managing Director, Frank Amah. At the High Court of Lagos State, the appellant and its Managing Director, Frank Amah, were arraigned on a six -count charge for the offences of (a) Conspiracy to obtain money by false pretences; (b) obtaining money by false pretences and (c) stealing. Following their plea of not guilty, the matter went to trial. At the close of the Prosecution’s case, the defendants made a No-Case submission. On October 14, 2009, the High Court upheld the No Case Submission. Accordingly, the Court acquitted and discharged Mr Amah and the appellant on all the counts. Dissatisfied with the High Court’s decision, the respondent appealed to the Court of Appeal, Lagos Division. In its judgement of February 27, 2015, the Court of Appeal upheld the High Court’s decision as it relates to the offences of Conspiracy to obtain by false pretences and obtaining by false pretences. The Court of Appeal, however, disagreed with the High Court on the offence of stealing. It held that a prima facie case of stealing had been established by the respondents against the appellants at the High Court. It remitted the matter to the Chief Judge of Lagos State for re-assignment to another Judge of that Court. The appellants were dissatisfied and they approached the Supreme Court to set aside the decision of the Court of Appeal. On the whole, the Court allowed the appeal and entered an order setting aside the judgment of the Court of Appeal. In its place, the Court upheld the findings and conclusion of the trial Court.